Ah Italy! You have gifted the world with your cuisine! Some day, I would love to visit Italy and get a first-hand taste of the cuisine for myself. For now, I’ll just dream while I’m stirring my risotto. This dish is a great weeknight slow down for a busy day. Though you stay pretty active for the cooking process, you’ll catch yourself drifting off while stirring and stirring. To me, cooking is relaxation. This was only my third time making risotto (I know, deprived!!) and it has delighted me each time. The recipe that follows is my adapted version from the package instructions and it is delish! There’s just something very homey and comforting about risotto. It’s rich and creamy and the slow additions of liquid make the rice hold all the flavor, so each bite is scrumptious. If you’ve never tried it, this recipe is a great starter for your collection of risotto dishes you’ll want to make over and over. You can use all kinds of veggies to change it up. Really, it has unlimited possibilities for deliciousness! Soak the tomatoes in the cup of hot water for 15 minutes. Remove the tomatoes and reserve the water. Slice the tomatoes into strips. In a small sauce pan, combine the reserved liquid and chicken stock and heat on low. Heat a large, deep skillet to medium and add 1 tbsp of the olive oil. When the oil is hot, add the asparagus and mushrooms. Saute until the mushrooms are browned and the asparagus is bright green. Remove and set aside. Return the pan to medium heat, add the rest of the olive oil. When the oil is hot, add the onion and cook until clear. Add the garlic and cook for one minute. Add the chicken and saute until halfway done. Add the risotto and saute for one minute. Stir in the tomatoes, oregano, basil and 1/2 cup of the chicken stock mixture. Stir constantly until the liquid is absorbed. Add the next 1/2 cup of liquid and repeat the process until all the liquid is gone. Finish the last addition of liquid by adding the wine. 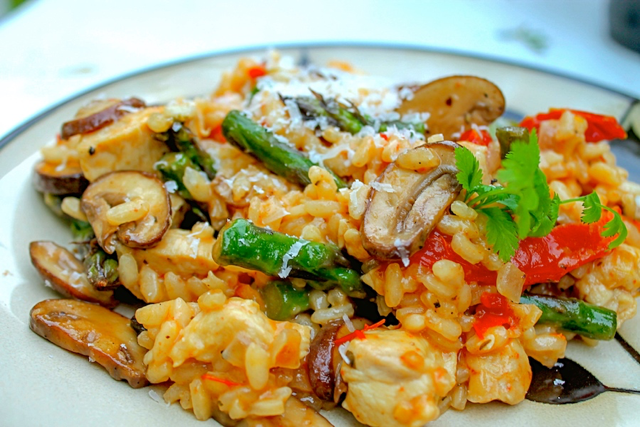 When all the liquid is absorbed and the risotto is soft and tender, add the asparagus and mushroom back to the dish. Stir in the 1/4 cup Parmesan cheese and add salt and pepper to taste. Korean Curry Rice ~ Save time and $$ using left overs to make new meals!